Growing up and as an adult I was terrified of bugs. When we moved to "the woods" at age 40 I fell in love with all the trees, birds, and wildlife. Even snakes. But bugs were an issue that I needed to work on. Loving all of Creation that was now around me, I knew I could love bugs also. They had a purpose and design and it was ridiculous to be fearful of something so small compared to my size. 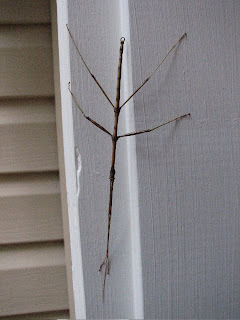 The Walking Stick is one of the first bugs I became fascinated with (along with the Praying Mantis). Although Walking Sticks are common, they are often overlooked, because it is not a pest to farmers or gardens. It uses camouflage for protection since it takes on the appearance of some other object. Although predators can easily distinguish it from its surroundings, because the insect looks like an ordinary twig, it gets ignored. When disturbed stick insects will sometimes 'play dead' for a few minutes to trick predators. These insects have suckers and claws on their feet which allows them to go up and down vertical surfaces even upside down, but they move very slowly. There are 2700-3000 stick insects identified in the world, depending on which study you read, and they are found mostly in temperate and tropical regions. They are from 3-7 inches long depending on the specific species. They have six slender legs that can easily compress against the body to look like a stick or mimic smaller twigs coming from the main body. These peaceful insects are strict vegetarians eating only plant foods such as berry, cherry and rose leaves. These critters generally feed in the dark, so they usually spend their days hanging from leaves or bark waiting for evening. They emit a foul smelling odor from glands on the thorax which also discourages things from eating them. 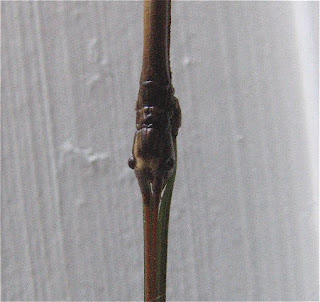 If there are no males in the area, a female Walking Stick can lay healthy eggs which hatch, but this has disadvantages. The young are identical to the female, allowing no random variations. Stick insects find mates easily in groups, but scattered females attract mates by emitting a pheromone, which is a seductive scent. The two then mate while clinging to a twig or leaf. The female scatters her eggs which fall to the ground and each egg, protected by its seedlike appearance and hard shell, may stay on the forest floor for up to three years. Eventually the young insect emerges. Young walking sticks are usually olive green and turn brown as adults. The Walking Stick has the unusual ability of partial regeneration. If a leg is lost or damaged it will grow back after several successive molts, or shedding of its skin. By molting the walking stick is able to grow quickly in size in just a few months. The Walking Stick eats its own molt.